The view from the deck of the Xue Long. 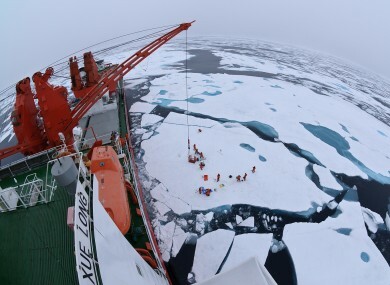 A CHINESE ICEBREAKER that went to the aid of a Russian ship stuck in heavy floes in Antarctica has now itself become trapped by ice, officials said today, amid anger about the impact of the rescue on research. The Xue Long, which on Thursday used its helicopter to ferry dozens of passengers on the stranded Russian ship Akademik Shokalskiy to the safety of an Australian vessel, has been unable to free itself. “Xue Long has confirmed to the Australian Maritime Safety Authority it is beset by ice,” the authority said in a statement. The Xue Long, or Snow Dragon, came tantalisingly close to cutting through heavy ice to reach the Shokalskiy a week ago but had to abandon its attempt once it realised it could not break through. It has hardly moved in recent days. Chinese news agency Xinhua, which has reporters onboard the Xue Long, said the ship’s passage had been blocked since Friday morning by a drifting, one-kilometre long iceberg. Captain Wang Jianzhong said the constantly changing position of the massive iceberg, which sometimes came as close as 1.2 nautical miles to the ship, and ice floes was making conditions complex, Xinhua reported. The Chinese vessel will only attempt to free itself after this huge block of ice moves away, with Chinese Premier Li Keqiang urging the ship’s team to stay calm as they wait for the best moment to act. Australian authorities said the master of the Chinese ship had confirmed that the vessel was safe, was not in immediate distress and did not require assistance. The ship has food supplies for several weeks. The Shokalskiy remains stuck in ice 100 nautical miles from the French Antarctic base of Dumont d’Urville with 22 crew on board. Several attempts by icebreakers to reach the Russian ship failed, including by the Australian Antarctic supply ship the Aurora Australis, while poor weather initially delayed helicopter rescue plans. The 22 scientists, 26 paying passengers and four journalists on board the Shokalskiy who were helicoptered off the ship are now on the Aurora Australis, which had been standing by to help the Xue Long. However, AMSA Saturday released the Aurora Australis to continue its journey to Australia’s Antarctic base Casey, where it is due to deliver supplies before heading to the Australian city of Hobart. “The masters of both Akademik Shokalskiy and Xue Long agree that further assistance from Aurora Australis is no longer required and they will be able to provide mutual support to each other,” AMSA said. Australian authorities have said that any inquiry into how the Shokalskiy came to be stranded would have to be conducted by Russian authorities but have acknowledged that the incident could impact guidelines for polar expeditions. The rescue mission, which also initially involved the French ship the Astrolabe, has also impacted some Antarctic research programmes, according to Yves Frenot, director of the French Polar Institute. The rescue mission forced French scientists to scrap a two-week oceanographic campaign this month using the Astrolabe, he said. “But we are relatively lucky. The Chinese have had to cancel all their scientific programme, and my counterpart in Australia is spitting tacks with anger, because their entire summer has been wiped out,” he said. The Aurora was forced to suspend its resupply of the Australian base to rush to the aid of the Shokalskiy, but authorities said it was not yet known what impact the incident would have on scientific programmes. “The diversion will inevitably squeeze an already tight season,” Jason Mundy, acting director of the Australian Antarctic Division, said Friday, adding that officials were working hard to minimise the impact. The trip on the Akademik Shokalskiy was aimed at emulating a 1911-1914 expedition by the Australian explorer, Sir Douglas Mawson and Frenot said “this kind of commemorative expedition has no interest from a scientific point of view”. The scientists onboard, assisted by the passengers, were repeating century-old measurements to discover the environmental changes taking place in the frozen southern region. They were also looking at the circulation of the Southern Ocean and the sub-Antarctic islands as thermometers of climatic change. Email “Chinese ship used in Antarctic rescue now stuck in ice”. Feedback on “Chinese ship used in Antarctic rescue now stuck in ice”.